If you are new to family history research, you may find this information helpful. Findlay - Hancock County Library OBITUARY files may be accessed here. This database took over 20 years to accomplish and serves as an excellent resource for obituaries. The list Archives date back to 1997 and may provide a means to connect with other researchers working on your lines and other information. This "virtual library" of historical documents that have been contributed by researchers. Here you will find the individual Ohio Counties' Archives, and you may find items such as wills, obituaries, letters, biographical sketches, County and Township histories, census, cemeteries, etc. Search the Archive of Messages for OHHANCOC Mailing List: Click to access several years of posts to the Hancock County mailing list. In addition to query requests, many researchers have posted items like obits and other information about their family research. When asked for the name of the list, enter OHHANCOC (OH for Ohio and Hancock for Hancock County. You may use a similar approach to access other United States county lists. Birth Records Contributed by Hancock County researcher. Click here. 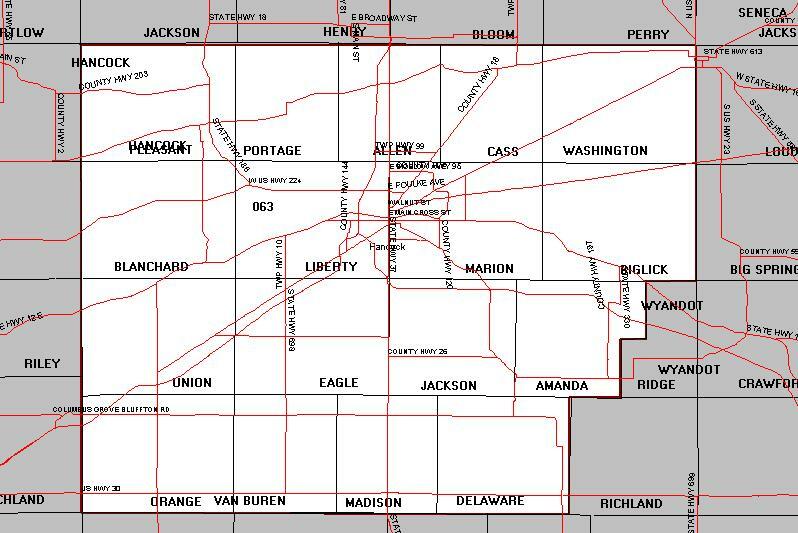 This web site lists Hancock County Cemeteries and includes maps to location. Death Records Contributed by Hancock County researcher. Legal briefs - contributed by Hancock County researcher. Click here. These are short historical pieces discussing the daily lives and activities of people in the County. Information includes births, deaths, marriages, appointments, visitors to the county and more during the 1800's and early 1900's. These records are extracted from the Bureau of Land Management Database for the state of Ohio. It shows the original purchasers of land from the federal government and covers the period from pre-Revolutionary times up to 1908. 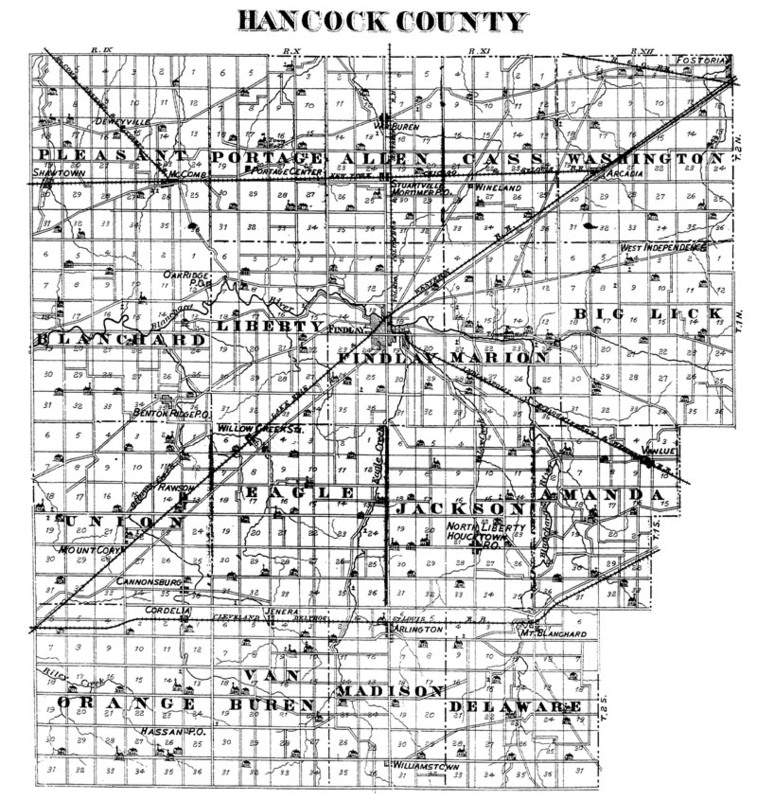 Land Records contributed by Hancock County researcher. Click here. Leave the subject line blank and put the word SUBSCRIBE in the message body. You will receive an automatic response confirming your subscription along with instructions on how to post messages and unsubscribe when you choose. The LIST membership is free. Note: This is a PDF file and requires Adobe Acrobat Reader to read the file. This onsite resource lists various Hancock County marriages 1828-1945. Click here. Do not miss this resource if you need to decipher a medical diagnosis that used the old terminology. Click here. Hancock County Researcher obituary submissions click here. Abstracts of selected wills contributed by Hancock County Researcher. Click here.